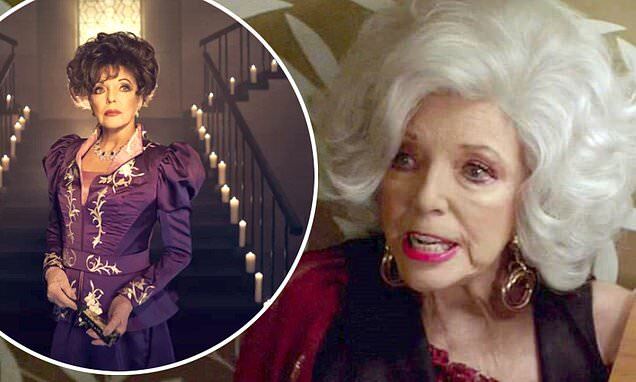 Having made her debut as self-centred Evie Gallant at the start of American Horror Story: Apocalypse, Joan Collins didn't make it past episode three after she was 'accidentally' stabbed to death by her grandson. And while fans were sad to see her come-and-go so speedily, they were relieved when the British star, 85, cropped up again in the seventh episode of the newest season. While returning from beyond the grave isn't an uncommon occurrence in AHS, nor is unheard of for the stars of the show to play more than one character; and Joan cropped up as new character Bubbles McGee in the episode entitled Traitor. Bubbles, a witch, possessed the power of reading the thoughts and 'souls' of others, and was involved in an important plot revelation for the season, concerning the planned assassination of the witches of Cordelia Goode's [Sarah Paulson] coven. But one scene in particular stood out - with Bubbles acting in a film called A Christmas To Dismember, in which she cuts open her on-screen husband's stomach and removes his intestines after he presents her with flat shoes as a festive gift [which was a nod to her 1972 film Tales From The Crypt]. This left viewers both delighted and mortified in equal measure, with many hailing her a sensation. 'Joan Collins should have been in American Horror Story sooner,' someone declared, referring to the fact that the show has been on air for eight years and has only now featured the legendary star. 'You were absolutely Sensaaaaaaaational!!!!!!!!!!! We're truly truly Honored to be Graced with YOU and your Beautiful Extraordinary LEGENDARY PRESENCE and CRAFT, JOAN COLLINS!!!!!!! LOVE YOU, FOR ALL ETERNITY!' another gushed.